The political affiliations of Thais from the middle class, the south, the north, and the northeast are examined in four chapters. Middle-class and southern interviewees discuss their reasons for joining the PAD and PDRC, notably their devotion to Rama IX and their anger at Thaksin Shinawatra's "alleged disloyalty to King Bhumibol. Most interviewees cited this issue as a decisive factor in turning them against Thaksin." The book also confirms a widespread and patronising sense of middle-class superiority: "All interviewees stressed a lack of education among Thaksin's supporters as evidence that elections in Thailand lack legitimacy; the uneducated simply succumb to vote buying." In contrast, two chapters on the north and northeast focus on the red-shirt movement and the UDD, asking two pertinent questions: "Why was there so little resistance to the coup? Why were there so few Red Shirt protests in the twelve months following the coup?" The junta's intimidation tactics provide the answer: red-shirts are closely monitored and coerced into renouncing all political activity, including one interviewee who "had to promise not to wear a red shirt, or even a checked shirt containing red in the pattern." Other chapters have a broader focus. Prajak Kongkirati expands his earlier essay on the 2014 election (in Military, Monarchy and Repression) to analyse forty years of election-related violence. Surachart Bamrungsuk provides a potted history of Thai coups, demonstrating that, for the military, practice makes perfect: "The absence of external security challenges has left the army free to involve itself in political affairs and to become more skilled in political manipulation." 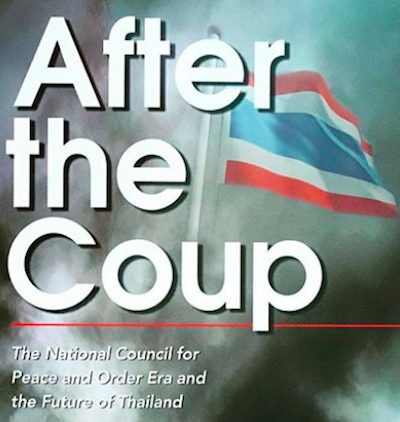 Thongchai Winichakul (updating his essay in "Good Coup" Gone Bad) examines the prospects for royalist hegemony following the succession. Puangthong Pawakapan surveys international media coverage of the monarchy since the 1960s, noting how critical reporting has increased since the 2006 coup: "The foreign press was instrumental in constructing a benign image of King Bhumibol in the international arena, and was thus complicit in entrenching the power of the monarchy. However, the political coverage of Thailand changed after 2006. The foreign press began to see the monarchy... as a crucial factor in the conflict that now engulfed Thailand."